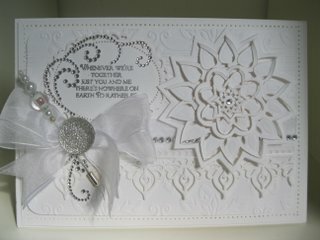 This is the ever popular White on White card and the addition of the centrepiece makes it look really special. 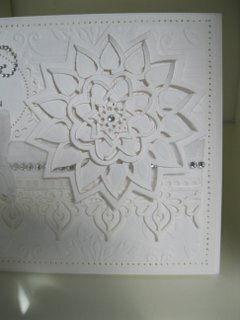 I have used the Floral Burst for this card from the Spellbinders Range of dies and they are very easy to use. There are three different sized dies in each set and they can be mixed and matched with any of the other sets too. The Floral Oval has the sentiment added and then mounted on foam pads to give some height. There are several sets of these dies and new ones are being added to the range all the time. This White card shows the dies layered up together with a gemstone in the centre ... but you can use them as stand alone pieces if you wish. 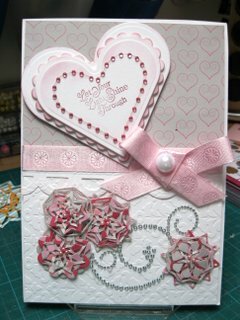 The Pink card shows all the smallest dies from each of the sets used as flowers on the bottom portion. 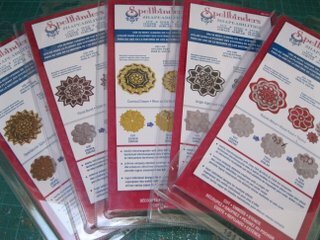 But however you decide to use these Spellbinders dies you will not be disappointed with the result.